A charming colonial hotel right in the heart of Pinar Del Rio, Vueltabajo is a good choice for those wanting traditional Cuban culture away from the main tourist areas of the island. The Vueltabajo hotel is Pinar Del Rio in a nutshell: a bustling, old-fashioned place with beautiful architecture & an aura of old Cuba. From its colonial arches to its high ceilings & marble staircase, there is an ancient splendour about Vueltabajo. The hotel is clean & well maintained, with a restaurant & bar serving adequate food & drink, though the choice for food can be a little limited. Those with mobility issues will find Islazul Vueltabajo hotel unsuitable as there is no lift & rooms are on the first floor. 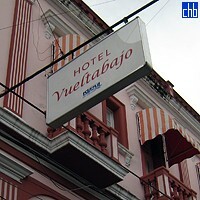 Vueltabajo’s outside rooms can be affected by street noise, though this is offset by the colourful sights & sounds guests experience from those balconies, including a regular flow of classic American cars. Islazul Vueltabajo is a well-maintained, charming budget hotel which is ideal for anyone wanting a short stay in Pinar Del Rio & the chance to sample authentic old Cuba. The rooms are all clean & well maintained by enthusiastic maids. All rooms are ensuite with simple furnishings & classical high ceilings. Some may feel on the small side as they have no windows but all have good air conditioning. The inside rooms are highly recommended for those seeking a comfortable night’s sleep away from the street noise.